The lungs are an essential organ which is necessary for the exchange of oxygen and carbon dioxide from the body. The principal function of the lungs is to transport oxygen from the atmosphere into the bloodstream and to release carbon dioxide from the bloodstream into the atmosphere. Each alveolus is tightly wrapped in blood vessels and it is here that gas exchange actually occurs. The diaphragm contracts during inhalation, and relaxes during exhaltion. The pleural cavity is the fluid-filled space between the two layers of the pluera, and provides a space for the lung to expand against during inhalation. Too little ventilation indicates a shunt (lack of air supply relative to perfusion ), while too little alveolar perfusion indicates alveolar dead space from damage or disease. These are both considered V/Q ratio mismatches. pleura: The double-layered membranous lining of the thoracic cavity that covers the lungs. V/Q ratio: The ratio of ventilation and blood perfusion of the lungs. Its balance is an important indicator of lung function and efficiency. The lung is the essential organ of the respiratory system. 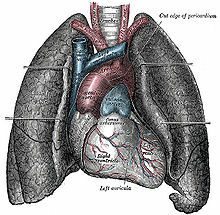 In mammals and more complex life forms, the two lungs are located near the backbone on either side of the heart. Their principal function is to transport oxygen from the atmosphere into the bloodstream, and to release carbon dioxide from the bloodstream into the atmosphere. Air travels through the mouth or nose into the pharynx, larynx, trachea, and bronchi and bronchioles in order to reach the lungs. The exchange of gases is performed by the alveoli, the functional units of the lungs. The human lungs flank the heart and great vessels in the chest cavity: The human lungs flank the heart and great vessels in the chest cavity. The lungs are found in the thoracic cavity, and extend laterally into the right and left halves around the heart. The rib cage is a structure of bones that surrounds and protects the thoracic cavity, with 12 ribs protecting each of the two lungs. The vertebral column is posteriorly attached to the ribcage and the lungs. The lungs are cone-shaped—the apex refers to the top of the lung, while the base refers to the bottom of the lung. The base is curved inward to allow it to rest on the diaphragm. The diaphragm, a sheet of skeletal muscle that lies beneath the lungs, plays an important role in inhalation. The right lung is larger than the left lung, and the left lung contains the cardiac notch, a concave impression that the heart lies against. The outer layer of the lungs are the pleura, a type of mesothelium (membrane tissue) that surrounds the lung and attaches it to the thoracic cavity. The pleura contain two layers, the outer parietal pleura (attached to the thoracic cavity), and the inner visceral pleura (covers the lungs). The pleural cavity is the fluid-filled space between the parietal and visceral pleura, and provides room for the lung to expand during inhalation. The fluid inside the pleural cavity protects against irritation during inhalation as well. 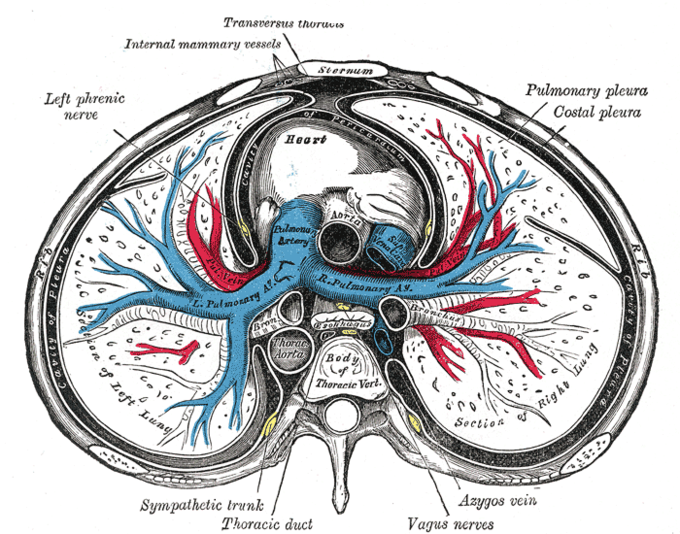 Interior of the thoracic cavity: This is a transverse view of the thoracic cavity, showing the pleural cavity and the major structures around the lungs. The interior of the lung contains the alveoli, where gas exchange occurs. The alveoli branch off from the bronchioles and bronchi that connect to the trachea and allow air to pass into the lungs. The lungs are divided into lobes by fissures on the outer surface of the lung, and divide further into segments and finally into hexagonal lobules, the smallest divisions of the lungs. Breathing is largely driven by the muscular diaphragm at the bottom of the thorax. Contraction of the diaphragm pulls the bottom of the cavity in which the lung is enclosed downward, increasing volume and thus decreasing pressure, causing air to flow into the airways and into the lungs. During normal breathing, expiration is passive— no muscles are contracted—and the diaphragm relaxes from its contracted state. The elastic recoil of the lungs automatically pulls the lungs inward during exhalation. The rib cage itself is also able to expand and contract to some degree during breathing, through the action of other respiratory and accessory respiratory muscles. As a result, air is transported into or expelled out of the lungs. The major function of the lungs is gas exchange, which occurs in the alveoli of the lung. Oxygen dissolves through the extracellular matrix of the alveoli that lets the gas diffuse into the capillaries based on the relative partial pressures of the gasses (gasses flow from areas of high pressure to low pressure). Oxygen passively diffuses into the deoxygenated blood of the capillaries while carbon dioxide passively diffuses out of the deoxygenated blood and into the airways. Only a relatively small proportion of alveoli in the lungs are perfused with blood and actually take part in gas exchange. The ratio of ventilation in the lungs and perfusion of the lungs (the air and blood supply of the alveoli respectively) is called the V/Q ratio (with Q being perfusion); it is an important indicator of efficiency in the lungs. The V/Q in a healthy individual is variable but balanced, usually around.8, but can be higher or lower depending on the region of the lung sampled. An imbalance in V/Q ratio is called a mismatch, and indicates a severe problem. Too low perfusion (and a higher ratio) indicates alveolar dead space, while too low ventilation (and a lower ratio) indicates a shunt, which is a lack of air supply relative to perfusion. V/Q mismatches occur during many different kinds of lung failure, and have many different causes.